Ferrari probably has had secret talks with every driver in the paddock at some point. @Curufea: As I say, this will be back soon on our header scoreboard at the top of the site. We're currently having teething problems like Honda but hope to be back to our old best before long. I think Eric the Power Unit is suicidal..
BTW why to give life to silly season?? @rockedin123: Because it gives us all something to talk about! I'm a fan of the new format website also - I can no longer see any ridiculous and insulting messages beneath the articles - bravo ESPN ! What happened to Vettel's car? @KarthiK: No word yet. As soon as I know I'll let you know. It didn't sound too healthy, though. I've been in secret negotiations with Ferrari for a good while now. But I'm sure that if you ask them, they'll categorically deny it. @whiskywheels: They told me I was the only one I was talking to. Porca Miseria. @Gaurav: There's plenty out there. Hamilton would be an obvious choice if he's still not signed a contract, but then there's Bottas, Hulkenberg, and Ricciardo, just to name a few. whisperer : Insulting messages... when did that ? I am sorry its just that we are used a dedicated portal for f1 and not a shared corner on the mother of all sports portal dedicated to UK. You see cricket here on the top left corner, go checkout espncricinfo.com and you'll understand what we are talking about. @Abhishek: We're still a dedicated portal to Formula One, the content and approach to reporting news hasn't changed at all. The only things that changed is the look of the site and we're working on the early bugs we've got. If Eric the Honda regains a pulse, will Jenson be able to return to this session ? The quickest GP2 time in practice today was 1:42.441. Manor are currently slower than that time. Think of it as your favorite restaurant having a remodel not a change of ownership. Chef's the same, staff's the same, food's the same, just looks different, and is a bit harder to find. We're into the final hour, meaning the teams will have handed back those spare Pirelli tyres they get for these sessions. 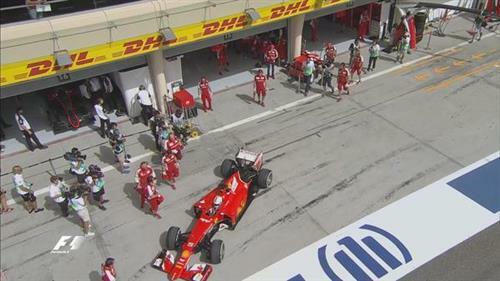 Hamilton executes a practice start at the end of the pit lane and gets under way. @Nate , who do you think will be the first Non-Mercedes WCC in the coming years, between Ferrari and Mclaren? @jee1: I'll stir the pot and say Mr Alonso. It's all pretty quiet out there, only the two Mercedes drivers out there. @BE: You all seem to be forgetting Verstappen is signed up with Red Bull. I can't see them giving him up without a fight. @AntonyMakanza: He's been very impressive so far. And only 17! @Questionaire: I can categorically rule that one out. Ferrari wouldn't go back to Massa when there are better and younger options available.